This is the last photo I will post that was taken with my old camera. My new camera has arrived and I plan to take it out tomorrow to test it out. I will have the results to post next week. I actually took this photo the last week of June, only about a week or so before my camera broke. It is of a rose bud in my own yard right after watering. They are all opened up now with the recent warm weather streak, and smelling lovely! Have a wonderful weekend everyone, and may you take time to smell the roses!! Perfection! Pure perfection! With that water drop it's by far the most beautiful bud I've ever seen. Thank you for sharing & have a lovely evening! I love the water drop! Pretty photo. Nice capture of the water droplet. Congrats on your new camera purchase! I'm sure you are itching get outside and try it out. Perfect bud and droplet. Congratulations on the new camera - sorry it had to come about because of a broken one, but enjoy all the same. Oh how beautiful! 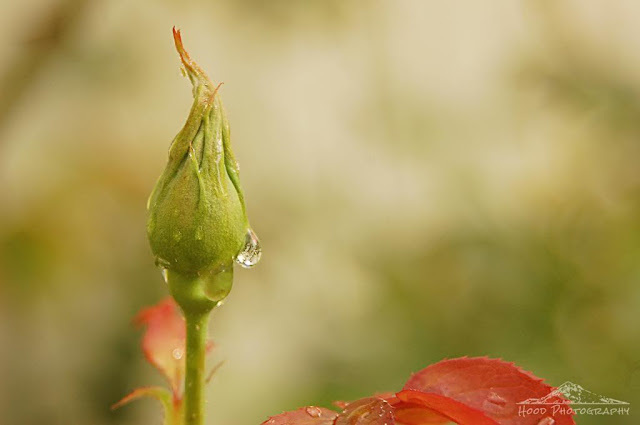 Love the water droplet on the bud. And the colors in the photo are so pretty. What beautiful detail captured in this photo. How I love to smell the roses! A perfect shot, beautiful in every way! Fantastic shot! Sorry to hear about what happened to your camera, but I'm glad you've got a new one. Hope you'd find time to visit Layered. this is absolutely beautiful. have fun with your new camera.